At first glance, it seems laziness is being celebrated in a new exhibit at the Aldrich Contemporary Art Museum. The show is called “The Seven Deadly Sins — Sloth,” and visitors don’t even have to walk around the Ridgefield museum to see it. Just sit in a Bob-O-Pedic lounge chair and watch short videos in air-conditioned comfort. Then leaf through a newspaper that’s all about loafing. How easy is that? “Yes, this is an exhibit where you come in and sit in one of six chairs,” said writer Sina Najafi, who created the show with artist Mats Bigert. But it goes much deeper. “Sloth” is part of an exploration of the seven deadly sins, which originated with Evagrius, a fourth-century monk. Najafi said Evagrius saw sloth as a complex sin with two halves. It’s not just about being a couch potato, he said. It’s also about spending time doing things that make you seem busy, but that actually keep you from what you really should concentrate on. Evagrius was concerned with monks whose frantic activities made it impossible for them to focus on God and the world. Najafi said a modern-day example would be people who are constantly texting and looking at Facebook when they could be spending real time with friends and loved ones. Sloth is among the seven deadly sins, which include greed, envy, gluttony, lust, wrath and pride. Each is explored in separate shows at different venues as part of a collaboration with the Fairfield/Westchester Museum Alliance. 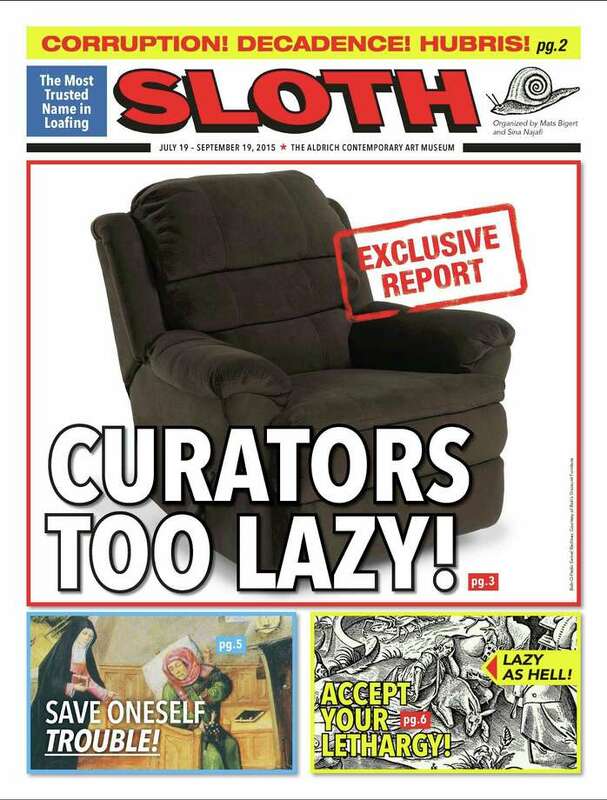 “Our show makes it unnecessary to go to the other six shows, perhaps committing the sin of sloth by letting the viewer sit comfortably and armchair travel to those venues,” said Najafi, an Iranian-born artist who is also editor-in-chief of Cabinet magazine. In Connecticut, the Bruce Museum in Greenwich takes on pride. In New York, envy is explored at the Hudson River Museum in Yonkers; lust is the theme at the Hudson Valley Center for Contemporary Art in Peekskill. Visitors can get their fill of gluttony at the Katonah Museum of Art, while greed fills the Neuberger Museum of Art in Purchase and wrath finds a home at Wave Hill in the Bronx.